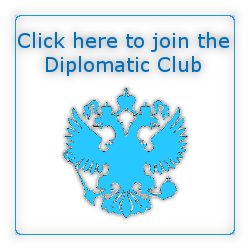 The Russian Embassy in London presents the Diplomatic online club – a way for everybody interested in international policy and all things Russian to gain knowledge, get insights from top diplomats and be part of fascinating networking, both online and offline. What do I get? Members receive a newsletter with news and analysis handpicked by the Russian Embassy in London, participate in regular competitions and prize draws, and are invited to a special reception at Ambassador’s London residence. But most important, you become a part of a global discussion, by not just spreading a message, but also sharing your personal views. How do I join? To join, you need to sign up below with your Twitter account. By signing up, you will follow the Twitter feed of the Embassy (@RussianEmbassy) and automatically retweet one of his most important tweets each week. You will be able to select the category of posts that you would like to retweet. The app does not allow us to see any personal information, incl. passwords. All information provided by you is voluntary and in line with Twitter’s policies. Only authentic Twitter users may join, no fake accounts allowed. Make a click and …welcome to the world of digital diplomacy, diplomacy of the future!